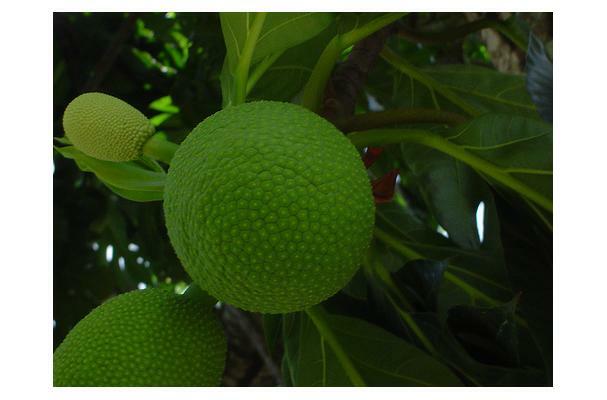 Breadfruit has to be the most widely used staple in the Caribbean. Almost everyone has a tree growing in their backyard. The name may be a little misleading, because Breadfruit has the texture and consistency of yams, sweet potatoes and similar ground provisions. Breadfruit is so named because it was the daily bread for many islanders in the older days and breadfruit can be used to create an endless list of recipes. The best stage to use Breadfruit is when it is slighty under-ripe. The riper it gets the sweeter it becomes and then it's not as versatile in recipes. Go to any village on any island in the Caribbean and you may well see some young men roasting a breadfruit on an open fire. Some will argue this is the best way to eat a breadfruit. Bear in mind, however, that the core should not be eaten and needs to removed prior to cooking, with the exception of roasting where it can be removed afterwards.